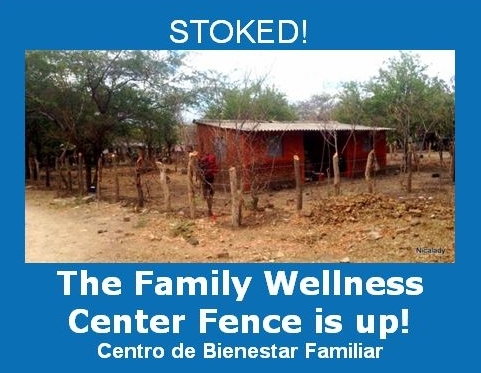 Missions of Grace > MOG News, Views & Blog > Family Wellness Center > The Family Wellness Center Fence is up! Stoked about this Wellness Center accomplishment! On Monday, April 11, 2016, we indeed ‘placed our flag’ on the property of our new health center in Las Salinas, Rivas, Nicaragua. The fence is complete. Our target opening is January, 2017. You can read all about our exciting Family Wellness Center project HERE. This has been our motto for many years. We truly could have never accomplished all that we have without team effort and the generous support and actions of people who love us and believe in our cause. 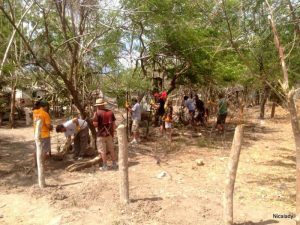 One of the significant things about the fence project, to me (Cheri) is that it happened without me in Nicaragua. We have a growing team there and I thank God for them. I would like to give a shout out to those who made this happen. 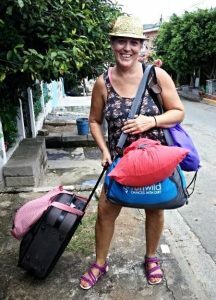 The MOG Nica staff: Sarah and Baldo Baldovinos, who live in San Juan del Sur (Nicaragua). Without their leadership and sacrifice of time, this would not have taken place. Kathy Silva (my assistant in Las Salinas) who found the local men to work with us and coordinated the project in an amazing way. Surf with a Purpose, a tremendous group who travel and surf and give back in each place they go. They not only gave us the labor, but raised money for the materials. Nicaragua Surf Report, based in Tola, Nicaragua. They provide a daily local surf report, run a surf shop and manages vacation rental properties in the exclusive Hacienda Iguana development. They are continually looking for ways to give back and gave a generous donation for our fence. APRODIN: The Indigenous Leaders Committee of Las Salinas have donated the land and the existing building for MOG and our new clinic. Transomar: The transportation guys who were great to work with. Our Supporters who made this happen with their generous donations in answer to my request over only a few days on a tight deadline. Thank you so very much! You are an extremely vital element of our efforts to empower and help life be better quality for those we serve. God is good and we thank Him for you. WE LOVE YOU ALL!! Stay tuned for more reports, not only of our successes, but our struggles. That way you will know we are truly out there fighting the good fight and hopefully you will be encouraged along the way. This entry was posted in Family Wellness Center by Cheri Mauldin. Bookmark the permalink.